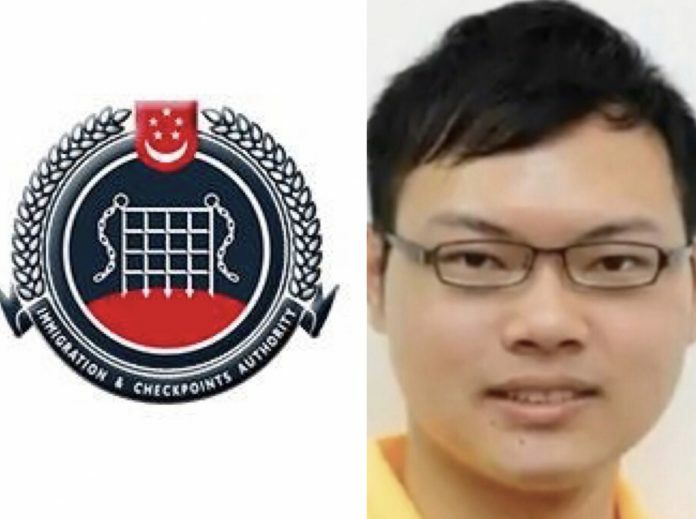 Alex Tan, the editor of States Times Review and its spin-offs, the Singapore Herald and Singapore Hereld, has remained outside of Singapore on an expired passport. He had submitted a new passport application to the Immigration & Checkpoints Authority (ICA), from overseas. ICA has processed his passport application. He will be required to return to Singapore to collect his passport. He can obtain a Document of Identity from the nearest overseas mission to facilitate his return. ICA would like to clarify that, contrary to what he has claimed on the States Times Review Facebook page, there was no “deal” struck between ICA and him, for the issuance of his passport. Related: Self-exiled Alex Tan returning to face the music? « What matters most in Politics? What should the little girl do? Please give her some good advice. Can collect at other country embassy ma… why make him produce carbon dioxide to fly and kill the earth ? Not entirely true. Persons of Interest (police, bankruptcy, owe CPF insurance money, etc etc etc) their passport will NEVER be allowed to be replaced from overseas. They will be compelled to return to “take care” of the outstanding issues before ICA will issue a fresh passport. Only when NONE of the gahment agencies are interested in the applicant then only the ICA will follow SOP and issue the passport to oversea. Otherwise its always the standard you must return to collect in person… bla… bla… bla. Caveat: Only an opinion. not a matter of fact. Check only with the relevant minister whenever in doubt. Even LEE SHENGWU kena bashed. Why is Sg becoming like N.KOREA? Is there a lee joong-un here? at least not as daring as the Fat Boy Kim. He didn’t have his family members assinated/executed/poisoned yet. Tech: 99% Alex already has a PR, so he need not worry about his expired passport. IMHO. ICA is talking cork here, they are making him to come back surrender than to collect his passport at the embassy in Australia! Your illuminations reminded me of this real-life case of a little boy,James Bulger, led to his murder – following the candy inducement. I see even unsuspecting foreigner adults in China got led by candy (cheap branded goods, beautiful young women etc) inducements following touts to their entrapment -ending with paying up enormous by extortions or killed or violently harmed by thugs in ambush waiting. On holiday, never follow strangers no matter what candy inducements. Came across this internet read of Sun Tzu, Art of War, which I think is implicit in many PRC’s mind thinking. you see these in trade negotiations. It is an interesting world outside there. He should not collect the passport at all. whether in SG or SG embassy in Australia. even if he steps inside SG embassy in Australia, they can detain him and Aust authorities cannot do anything to get him back. because foreign embassy ground in the host country is considered sovereign territory belonging to that foreign country. The US embassy compound at Holland Road, that is considered US sovereign territory. you cannot have SGP uniformed personnel (SPF/SAF) go into the embassy ground. considered invasion of sovereign soil. watch the movie Red Corner (when Richard Gere ran into the US embassy in Beijing). why hor in sinkie land, citizens must personally collect passport here. how come hor, some FTs (from some country many times bigger than sinkie land) can renew their passports here in sinkie land and collect their FT passports here in sinkie land ? don’t have to go back to their own country to collect ? don’t say that they are more efficient than our usual much self-prided garment institutions ???. and moreoever, sinkie land already practices open-leg policy like sinkie land belongs to everyone. full of ownself-check-ownself wayang irony. caveat hor : opinion lar not fact. So he will get a shock when I collects it? because the people have no courage to defend themselves. What do you mean “Only when NONE of the gahment agencies are interested in the applicant”. What is your definition of “interested”? Which can mean anything!!! It’s a trap, Alex Tan better not go back to Singapore to collect his passport. when Mr Lee SW passport expires at end of 5 years he shall face the same. of course, he can always do what Mr Amos Yee has done, give up the Spore passport. When I applied for my son’s passport online there was no option to collect overseas may be because of his NS unlike previously. It is possible but ShengWu is a special class of citizen and such instructions would have to come from the very top top leeder, if ICA wants to deal with him in the same way as Alex. I don’t think some ICA officials would want to make the decision to deny ShengWu without consulting the leeder. And yes I agree with you, with ShengWu’s wealth and qualification, the US of A would gladly give him a Green card anytime. Asking Alex to return to Singapore to collect his new passport is a trap. He will surely be arrested as soon as he arrives. Why does Alex have to return to Singapore? Singaporeans can usually collect their new passport in Singapore Embassy overseas. Alex should not return to Singapore. He should ask for asylum in Australia and renounce your Singapore citizenship so he can apply for Australian citizenship. As long as the ICA in Singapore has reason/s not to renew one’s passport sending it oversea, the only help one can expect from any office overseas will be the same help accorded to Alex, i.e. get a one-way ticket back to Singapore. iirc there was a police report made in sg against this alex for his postings on his defunct website. he was overseas all this while even when the report was made. this is the opportunity that someone who made the mata report had been waiting for? Wah, now Alex is on the same tier as Assange and Snowden. My heroes! Which countries on earth do not adopt this approach?